This might have been the lightest I’ve ever packed. Two pairs of lightweight cargo pants, one pair of leggings, two well-worn long-sleeve shirts, one short-sleeve, two tank tops, a sweatshirt, my jammies, my tennies, my undergarments, and my toiletries would be more than enough to get me through a week of construction work in Tijuana. I hoped. Beyond the clothing basics, I made sure that was plenty of room for the most crucial items: my passport, work gloves, goggles, an open heart, and an open mind. Bunking it at the posada, Spartan-style. When we arrived at the posada run by Esperanza, we made ourselves comfortable in our Spartan, dormitory-style dwellings. We were reminded that because water was a precious commodity in these parts, our daily showers would be limited to one minute per person. Thankfully the water ran hot. 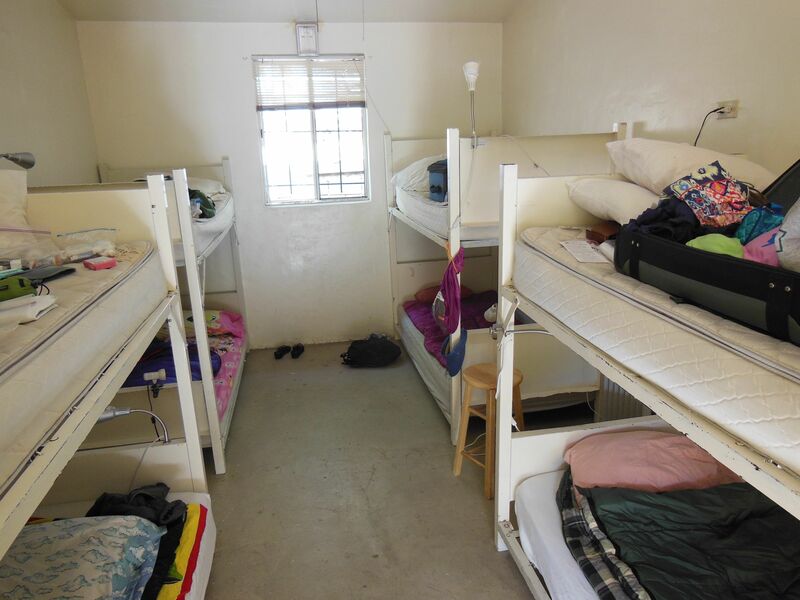 Despite our humble sleeping quarters, the posada was modestly comfortable and seemed fairly luxurious compared with some of the current living conditions of the families we were helping. Complaining would just seem cruel and selfish when you can see with your own eyes how little some people get by on without one hint of discontent. While we were there to contribute our physical labor, this certainly was no charity. 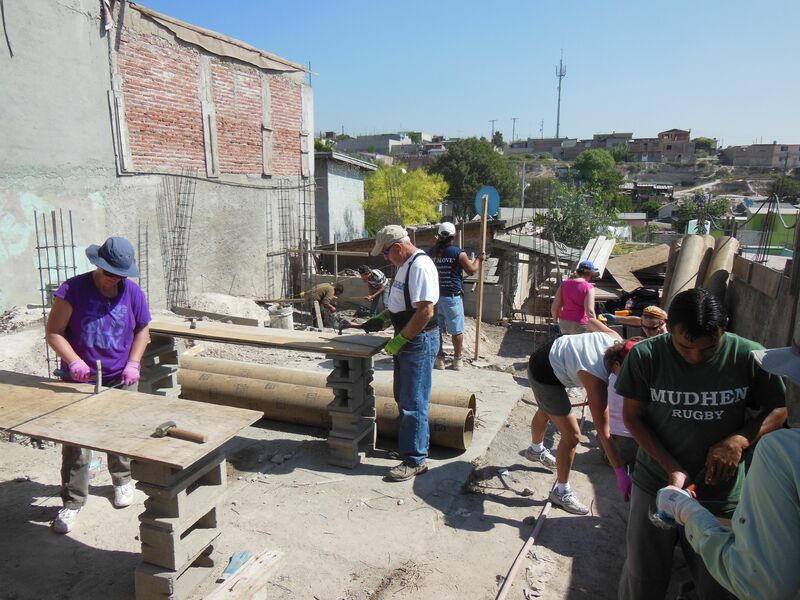 The families we were assisting had “earned” the services of Esperanza by committing to helping their own neighbors build their homes, by engaging with their community-run organization, and by contributing to the community fund that provides micro-loans to participating families. These are active participants who benefit from many hands making light work to make their dreams of a home for their family a reality. A new skill for me: making rebar squares to be used in rebar columns. We worked on three different homes in varying phases of construction. The first family we worked with had land on a steep slope. 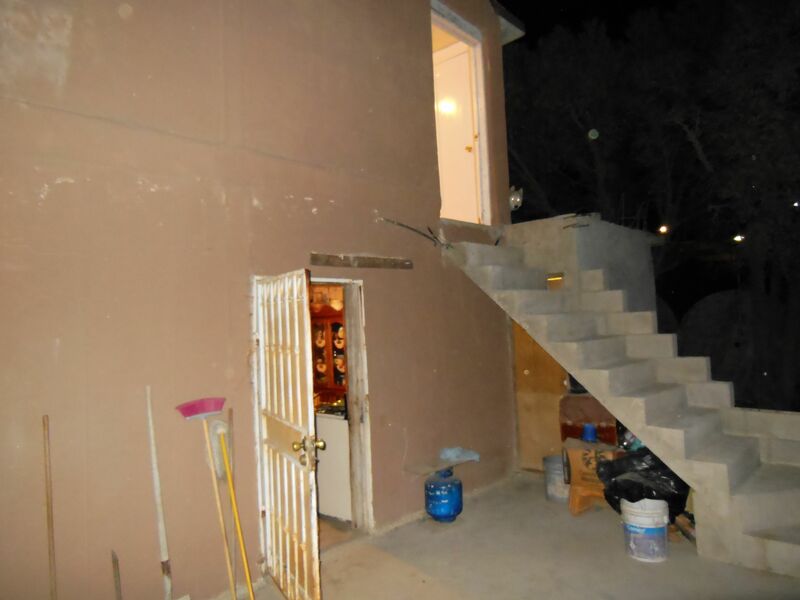 Because of flooding concerns and lack of proper drainage, we would construct large concrete and rebar columns, upon which the main floor of the home would be built. The work requires strength, endurance, and a mind that doesn’t wander–which I had. Luckily for me the construction skills–which I did not have–could be learned on the spot. 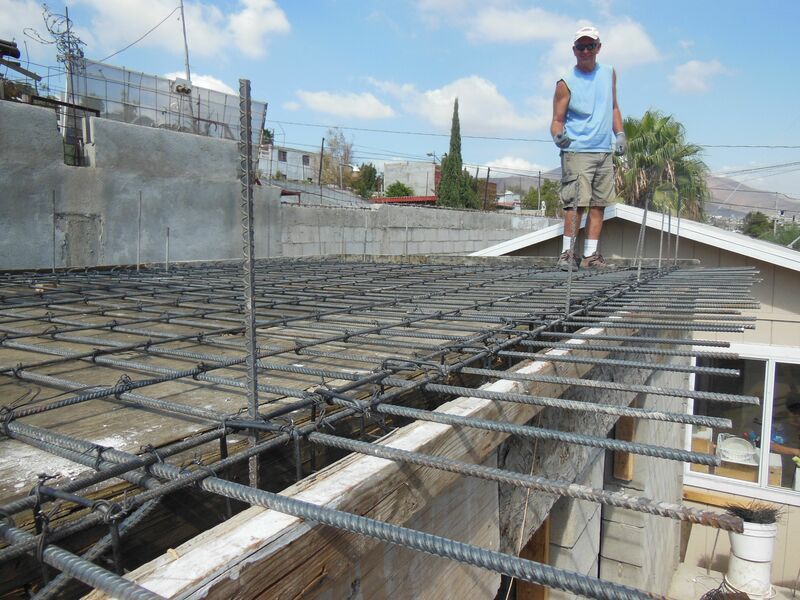 With my eleven fellow volunteers, members of the family, and the construction crew from Esperanza, we made rebar squares, tied countless wireless to bind said squares to form massive steel columns, and poured bucket after bucket after bucket of sloshy, home-made concrete. 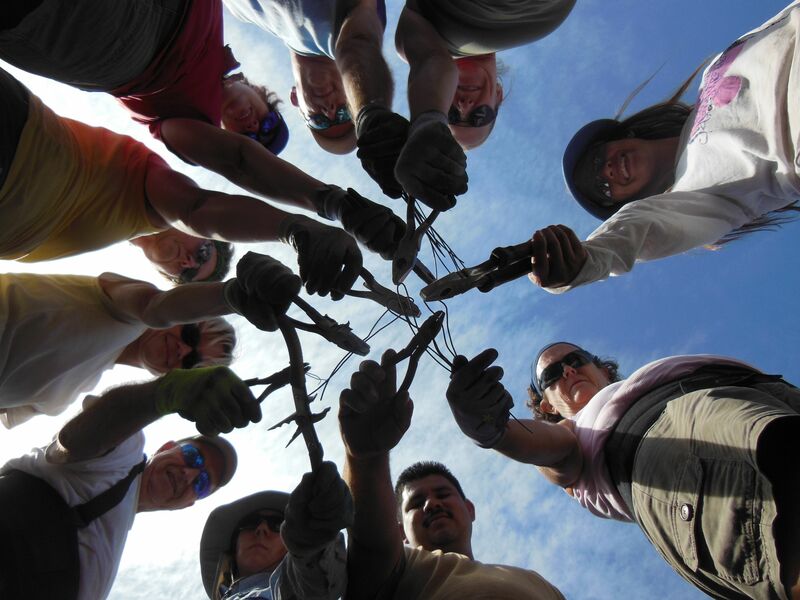 We spent two full days there under a blazing Mexican sun, focused on the tasks at hand, knowing that all our efforts would benefit a beautiful and deserving young family. We joined our group leader, Cliff, on the roof to help tie down the rebar checkerboard he laid out. At the second home, we laced together a seemingly endless checkerboard of rebar for top of an existing structure, upon which a second floor would eventually be built. With pinto bean-sized beads of sweat cascading down my face, I meticulously cut strips of wire to make wire ties for making rebar grid. When someone needed a break or just a change of pace, another volunteer would always be willing to take over and switch places. With so many of us working so diligently and happily, time flew by, and we ended the workday early, taking advantage of the extra time to nap, enjoy the sunset, and give our weary bones some well-deserved rest. Many hands make light (and quick) work. On one of the final days, we were down two volunteers, due to a 24-hour flu, and also had to split our team in two to work on two different homes. I chose to work on a place we hadn’t been to yet. While the family’s home had already been built by Esperanza a couple of years ago, they were lacking a wall around the perimeter. 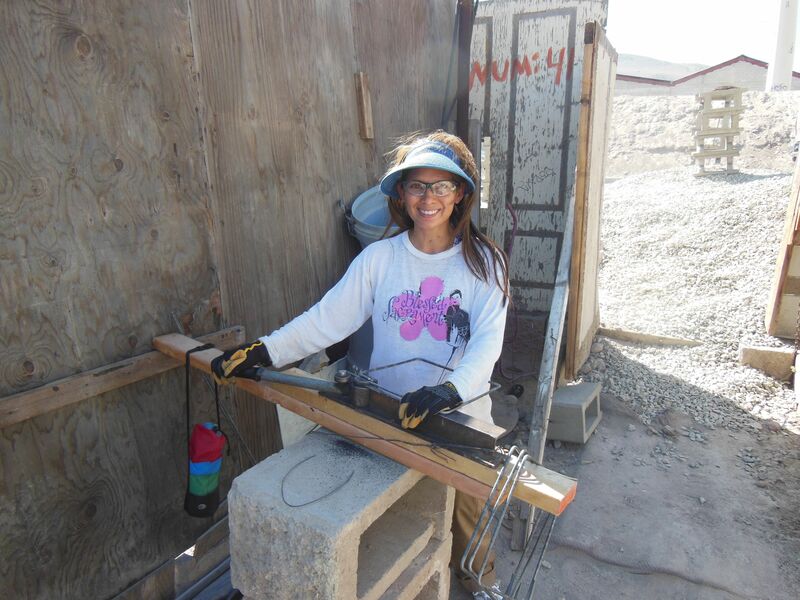 By now I was an expert at tying wire ties to rebar, and since I was the smallest volunteer at 5’1″ (barely), I got to go deep into the narrow trenches to position rebar and tie them off, stabilizing them for the concrete blocks that we all transferred in assembly line-fashion from one end of the property to the other. 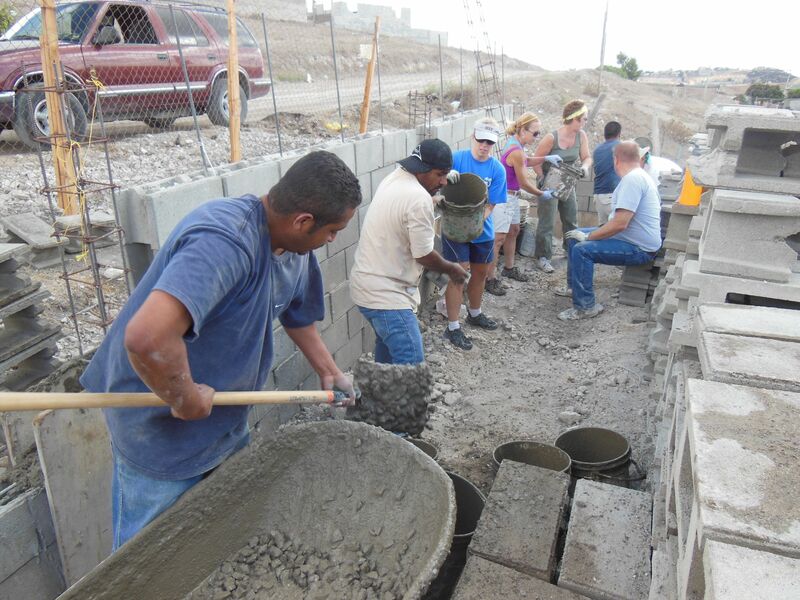 In assembly line fashion, workers pass buckets of concrete to fill in the cement blocks for a perimeter wall. Intent on getting the job done, we were like machines. Making wire ties, building rebar columns, stacking blocks, making concrete, pouring concrete– by now we had become so efficient at all of our jobs…or so I thought. Sometimes I got so focused on what I was doing and how I was doing it that my tunnel vision prevented me from seeing an even better way to finish the job. As the other volunteers formed a brigade to pass endless 5-gallon buckets of cement that would fill in the perimeter wall, I was the shoveler. The Shoveler of Sand. 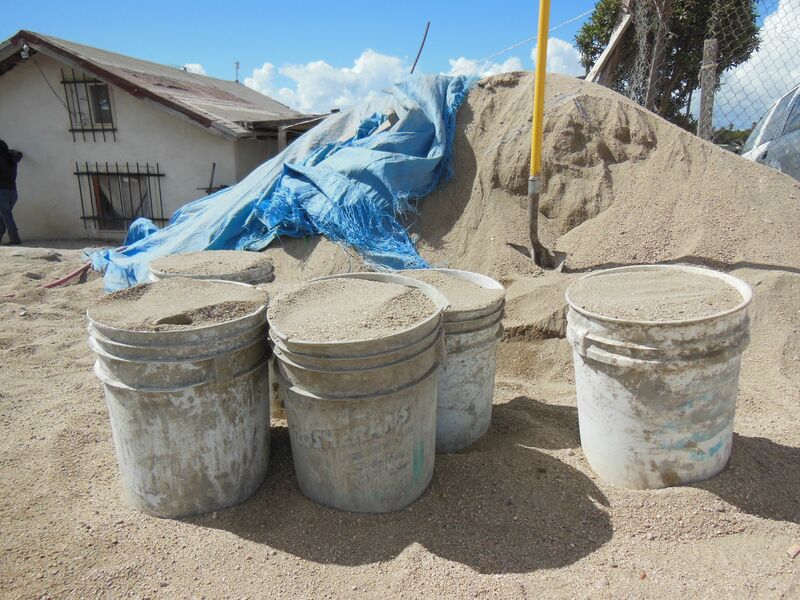 From a demi-mountain of sand whose summit was higher than my head, I shoved my shovel in to scoop out piles of gritty grains, filling the dozen plastic vessels that surrounded me, which would then be carried off, one in each hand, by a teenage neighbor to the cement mixer. After shoveling away nearly half the sand dune and paying the price with my aching back, I finally learned a better way to do the job…thanks to a helpful teenage neighbor. It was all quite rhythmic, à la Hokey Pokey. “You stick the shovel in, you pull the shovel out, you fill the bucket up, and off it goes without a doubt, they mix up all the concrete and they bring the buckets back. That’s what it’s all about.” It wasn’t until about bucket number 43 that my tag-team teenager kindly and with gentle pity showed be a less backbreaking way to do my job. While I had been loading individual shovel scoops of sand into the upright buckets, he demonstrated that laying the buckets on their sides with the mouths open to the sand mountain would allow me to use the awesome force of gravity to slide the sand into the buckets. I could then just tilt them back upright and have them ready to be carried off. With a stream of “¡Gracias!” flowing from my smiling mouth, we continued our work with twice the efficiency and four times the joy. 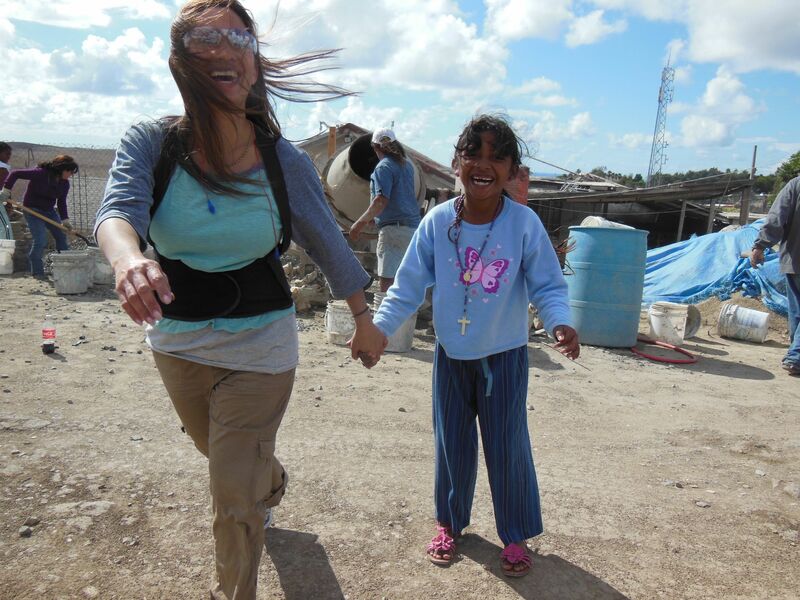 Bridging cultures by playing and communicating in Spanish with this precious little girl. It was always a welcome break to just chat with the family members and play with the kids. While it’s consistently rewarding to learn about someone–their life, their triumphs, their struggles, and their interests–it is doubly gratifying to communicate in their language. People want to share their stories, and when you can provide them the space to express themselves comfortably, the more they will open up. And that is a beautiful thing. Even if your own skills may be limited in their native tongue, you’ll find that you’ll understand more than you expected and make a deeper connection by making the effort to speak their language. This young mother of three expresses her deep gratitude and pride in the opportunity to have a home for her beautiful family. More often than not, the families simply wanted to express their gratitude. You could see in their eyes how appreciative they were of the help that we and Esperanza provided, how proud they were to have contributed in their own ways to help build their home, and how hopeful they were for the same kind of life-changing and community-building experience for their fellow neighbors. Committed to Esperanza for seven years, this family now has a second floor on their home, providing ample room for eight people. One family who came to visit us at the posada invited us back to their home to see how Esperanza had made their lives better. They began their relationship with Esperanza seven years ago, working within their community to help neighbors. Two years later, they built a small two-bedroom home, barely fitting their family of eight. After paying off their micro-loan, they added another room two years after that. And just recently they added a second floor with two more rooms. 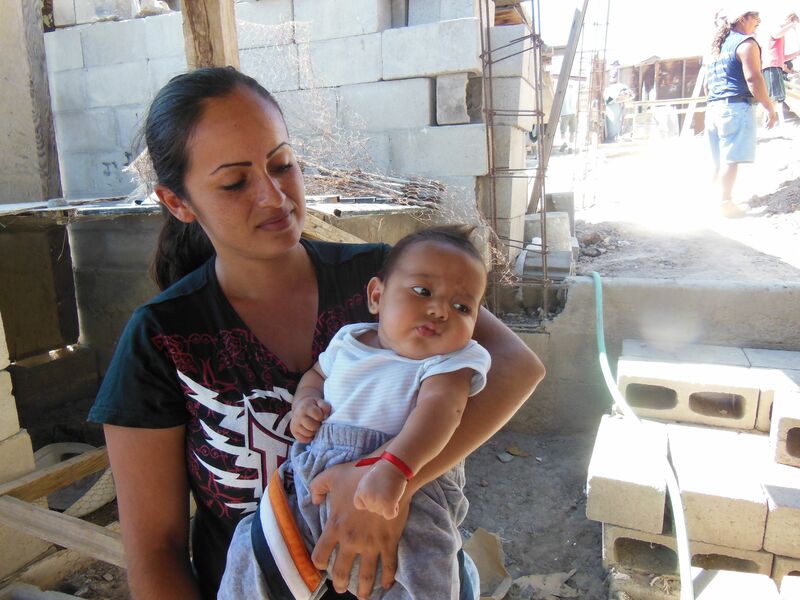 They continue to contribute to the Esperanza family of neighbors and to pay off this final micro-loan. 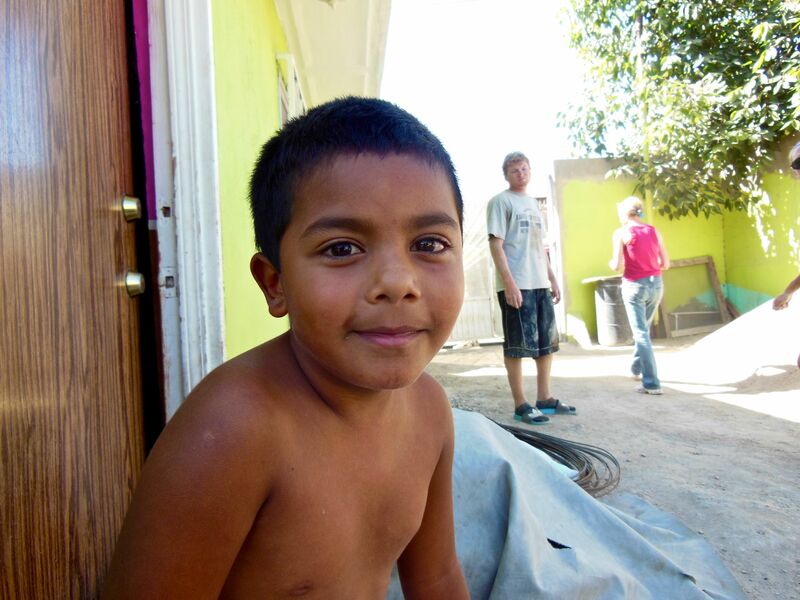 The confidence they feel in knowing that that their family is safe and secure in their own home and the eternal appreciation they have for Esperanza and the dozens of people who made this dream come true showed me that definitively once and for all that coming to Tijuana to volunteer to build homes is one of the most worthwhile things I’ve ever done in my life. 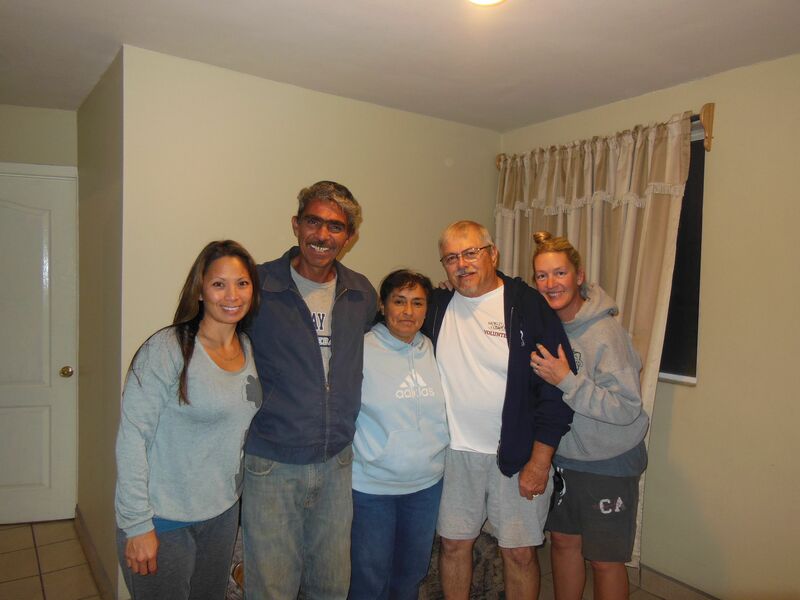 Tony, Cathy, and I were so humbled to be welcomed into this home and to learn of the family’s history with Esperanza. Whether you travel out of the country or just out of your neighborhood to help another person, you have the opportunity to learn so much about your fellow mankind and about yourself. Life has challenges for all of us. Travel lets you see first-hand the challenges that others face and how they strive to not only cope with them, but to overcome them. It’s not always easy, and one can’t always surmount them alone. Whether it takes a neighborhood, a village, an organization, or world neighbors from across an international border, we can find ways to step beyond our own boundaries to help make life easier, happier, and better for another human being. If, in our travels, we allow ourselves to be at the service of others in need, we can gain greater compassion, develop a broader perspective for the struggles of others and of our own selves, and become a kinder, gentler, and more enlightened citizen of the world. What greater souvenir from your travels is there? Extraordinary insights. Thanks very much. I lived in El Paso 29 years with initial misconceptions of Ciudad Juarez. It is a city under great stress but it possesses incredible cultural diversity and richness. I attempt to stay connected to friends there even after moving yo central Texas give years ago upon retirement. I love Mexico and hope to be able to safely travel there again. Commendations to you. I saw the link to your blog through Rick Steves. Thank you for your comments and sharing your own experience. It’s important to not let media hype and our own fears prevent us from seeing things as they really are and from looking deeper into the culture and peoples so close to us, yet so misunderstood. I, too, hope that you’ll be back traveling in Mexico in the not-too-distant future. And thanks for your support for The Travelphile.